Greatest gig of our lives is here! "Watch out music lovers, a Cold Snap is approaching!" In all seriousness. "One of the most talented bands doing the Melbourne Circuit" Who said that? Everyone!!!! "Cold Snap proved once more why they are rapidly on the ascent as a live draw card"
For a complete listing of all Cold Snap gigs visit our Gigs page. 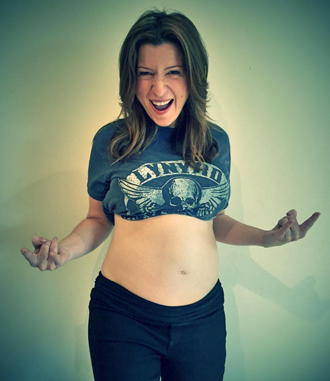 Great news, Joe and Sonia are expecting their first baby in July 2015. As a result we've decided to take a little break from performing live to focus our energy on building our new home and turning our family from a duo into a trio. We're looking forward to performing live together again in the future, but in the mean time family comes first. We'd like to thank everyone for all their support over the years, especially our fans who have always been there for us. Watch this space and we'll keep you posted regarding any upcoming gigs, recordings, etc. Take care and we look forward to seeing all again soon. 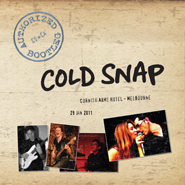 Visit the Cold Snap Shop for the full range of all the latest Official Cold Snap Merchandise. When purchasing via our online store you will have full access to exclusive items that won't be available at our live shows. Shop safe online with our verified store, and safe online shopping guide. We truly have something for everyone; from our T-shirts, Hats, Bags, Mugs, Stickers, Magnets, and even Kids Clothing. Check it out today! "Authorized Bootleg" SOLD OUT! Includes 17 live tracks and over 70 minutes of music. The wait is over! Email: info@coldsnap.com.au to purchase your copy today. CD's will also be available at all of our live shows. "The CD is nothing short of fantastic!" "It's one of the few impressive CD's received in recent times." "I have to say it's an outstanding CD! Production values brilliant, musicianship superb, and certainly presents you guys as one fine R&B/Blues band." Copyright © 2007 Cold Snap, All Rights Reserved.